Posted on July 16, 2014	by Katy K.
I’d heard enough about this that I snagged it off the new book cart and read the intro. That got me hooked enough to ask for an audio copy. 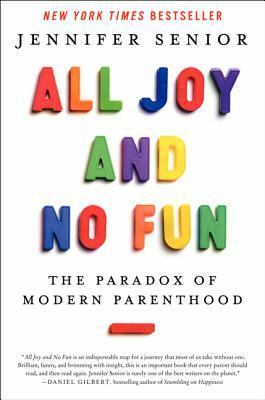 All Joy and No Fun: the Paradox of Modern Parenthood by Jennifer Senior. Read by the author. HarperCollins, 2014. There are lots and lots of books on how to parent children and the effects of parents on their children. Here, though, Senior synthesizes a lot of existing research, as well as going across the U.S. doing some good old-fashioned journalism, to find out how children affect their parents. I’ve gotten some strong negative reactions to the title of this book from people who are appalled at the idea that anyone might be suggesting that children aren’t fun, but the reality of the book is a lot more nuanced. Now we that we can choose parenthood, as Senior quotes more than once, children are “economically worthless but emotionally priceless”, a big change from the historical reality. These days we have children because we think they will be life-fulfilling, and we hope that our children will grow up to be happy. Both of these sound simple and straightforward, but as Senior point out, they are new goals from a historical standpoint, as well as being nebulous and – let’s face it – high pressure. The book is roughly divided into the stages of parenthood, with looks at the challenges and joys of each stage – the loss of independence, sleep, and “flow” with infancy, the vastly increased housework load, the over-scheduling of middle childhood stemming from the difficulty of preparing children for any future, and the life assessment that teenagers trigger in their parents. Along with the woes, we see the joys, the purpose, and the meaning, and the delight parents take in their children. This is an impressive book – did I mention all the research, from a wide variety of areas? All tied together and brought to life with stories of real families? My librarian heart loves things like this. From the parent standpoint, Senior’s approach is highly validating. She knows that parents love and cherish their kids, while being very upfront about saying that parenting is tough. There was a risk of the book turning into a litany of woes, but Senior keeps an upbeat and engaging tone throughout. She does a great job of reading her work, too, breathing life into the statistics and personality into the families she’s sharing with us. Whether in print or on audio, this is a great book for every parent. This entry was posted in Books and tagged Adult Nonfiction, parenting, psychology. Bookmark the permalink.